What is the world's most important source of fuel? Is it natural gas? No. Ethanol? Nien. It's pizza. Pizza is the world's greatest fuel for our bodies*. If you plan to spend Black Friday steamrolling little old ladies in front of a Best Buy, you want to have the energy required to throw an elbow without breaking stride. The deal: The chain's old standby is still around. You can do the "Mix & Match" offer to get any two or more pizzas, pastas, bread bites, or boneless wings, among other items, for $5.99 each. The deal: Lastly, there's a week-long promotion where you can pick up a large three-topping pizza or a medium three-topping handmade pan pizza for $7.99. That's available for carryout only. The deal: As long as you're ordering online, you can get a large two-topping pizza for $7.99. The deal: Order off the $5 lineup, and you can construct a feast. As long as you're getting at least two items, you get any combination of a medium one-topping pizza, boneless wings, pasta, breadsticks, garlic knots, or a variety of desserts for $5 each. The deal: The chain's new Double Cheeseburger Pizza sounds a bit like that Juicy Lucy Pizza at Giordano's. It comes with ground beef, Roma tomatoes, dill pickles, cheese, and a "zesty burger sauce." You can get a large for just $11 right now. The deal: Land a large five-topping pizza for $15. You know, in case you didn't get enough heavy food on Thanksgiving. The deal: Get a free two-liter of Pepsi when you order any pizza online. Use the code "FREE2L1" to grab the freebie. The deal: The classic Hot-N-Ready deal is always running. 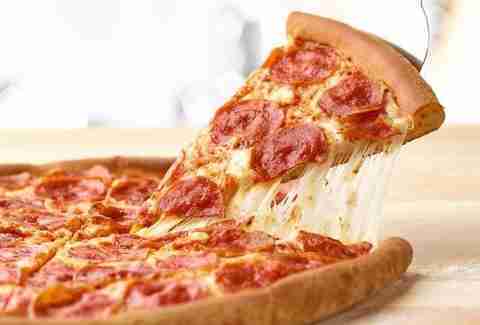 New to that menu is a large thin crust pepperoni pizza, which you can get for $6. The deal: Pick up a large two-topping pizza, and it's just $5.99 with this coupon. The deal: Like others above, Toppers has a mix and match-style deal. Order two or more of a medium two-topping pizza, Topperstix, boneless wings, baked mac 'n cheese, or monkey bread and they're just $5.99 each. Don't forget to ask for some of those sweet sauce cups. 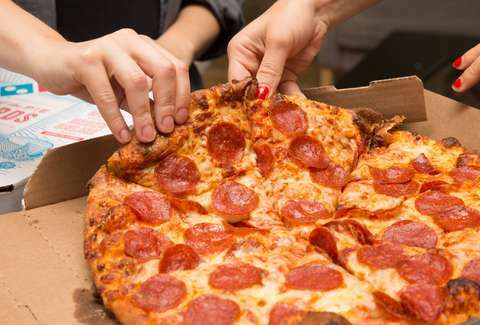 The deal: If you're ordering carryout, you can get a large two-topping pizza for $8.99. The deal: It was mentioned earlier, but it bears repeating. Giordano's is doing a Juicy Lucy Pizza at its two Twin Cities locations. It's pretty damn good, though it's definitely not on sale. The deal: Buy $50 worth of gift cards, and you'll get a free bonus card worth $10 at participating locations. You can get up to four bonus cards before they cut you off. The freebie can be used between December 26, 2018, and March 31, 2019. The deal: The app that helps you avoid chains and order from local, independently-owned pizzerias is doing something a little different over the weekend of shopping holidays. Instead of offering a discount, they're offering to support your love of pizza as well as your local shop. Tell Slice why you're thankful for your favorite local pizzeria and you could win $400 worth of pizza for your belly and $4,000 for your local pizza place to help them continue making that delicious, cheesy food you crave. * This is not a scientific fact. Looking for more Black Friday pizza deals? Check out the best sales at Walmart, Target, and GameStop as well as these cheap flight and TV deals. Hungry from all the shopping? Don't miss all the great free food and pizza deals running all day.